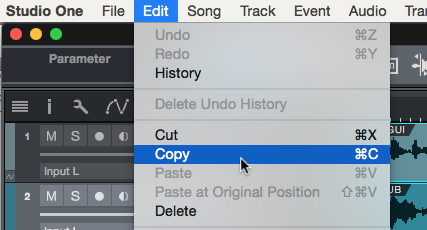 Ensure that Copy & Paste DAW in the View > Settings menu is set to Studio One. (a) Clicking the first region, and shift-clicking subsequent ones (the first to be selected bcomes the Guide, the rest the Dub tracks). (b) Highlighting the regions by dragging across them (the top track becomes the Guide).